Dyke Industries, Inc. is a family owned company that has served the Southeast U.S. as a wholesale distributor of a broad line of building materials, millwork and related products since 1866. Dyke provides a full complement of hardware, doors, windows, and trim and maintains an inventory of products from all of the most popular manufacturers including Jeld-Wen, Simpson, Masonite, and others. The company operates distribution outlets in Georgia, North Carolina, Kentucky, Missouri, Tennessee, Florida, Louisiana, and Texas. Dyke had been using an AS400-based software product that had been heavily customized over more than 30 years. 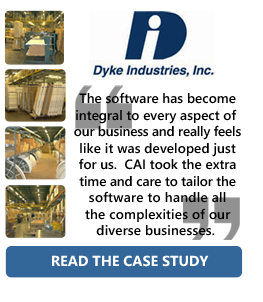 As Dyke’s product offerings expanded and configuration options proliferated, inventory management became increasingly more important.